Berlin Declaration on Interreligious Dialogue Preamble - 2008 has been declared the European Year of Intercultural Dialogue. In a pluralistic Europe dialogue across dividing lines – be they cultural, linguistic or religious – is of the greatest importance. All over Europe issues related to identity are hotly debated, and often religion is at the centre of discussions. Europe and Europeans are also constantly interacting with the rest of the world, experiencing the joys and the challenges of communicating across cultural and religious divides. Sometimes religion is seen as an obstacle to peaceful coexistence and social cohesion. At the same time we know that some of the most pressing challenges in our time – climate change, poverty, migration, marginalisation of women, discrimination and terrorism – can only be solved if we unite resources across traditional dividing lines. (1) Religion permeates Europe. Christianity, Islam and Judaism are part of European history. Today other great religious traditions have also found a place in the continent. In every town or village in Europe there is at least one house of worship: a Church, a Mosque or a Synagogue. To ensure a prosperous and harmonious future for Europe, people of different faiths must live peacefully together. (2) Interreligious dialogue emphasises both our similarities and our differences. In interreligious dialogue we acknowledge that human beings of all faiths share certain experiences, needs and longings. We also acknowledge that we are different from each other in many respects and will remain different. Our religious traditions have formed different social rules and models which sometimes contradict each other. One aim of interreligious dialogue is to reduce false perceptions of difference and culture gaps, while we respect that something about our dialogue partner will necessarily remain other (or even alien) to us. (3) Interreligious dialogue should promote respect for human rights. Interreligious dialogue should respect the shared values found within all great religious traditions and embodied within the Universal Declaration of Human Rights. Commitment to human rights does not preclude a variety of world views or ethical systems and interpretations. (4) The invitation to the dialogue is open. The more we differ, the more we need dialogue. It is not a precondition for dialogue that we share a wide spectrum of values and ideas. Only clear breaches of respect for the most fundamental values, such as the right to life and the rule of law, should exclude people from being invited into dialogue. While the invitation is open, everyone must abide by the agreed rules of a particular dialoguing situation. Women and young people have important perspectives and contributions to offer and should have distinct voices in interreligious dialogue. (5) Interreligious dialogue is a mode of relating to other faiths and has a transforming potential. Interreligious dialogue is a particular way of interacting with others through which all who are involved can be transformed. Dialogue on issues of faith and identity is not negotiations, because we do not seek agreement, it is not debates, because we do not seek to win over the other, and it is more than a discussion because we contribute not only rational arguments but personal and emotive stories and experiences and thus engage existentially with each other. (6) Interreligious dialogue affirms the integrity of religious beliefs. In dialogue we come closer to each other without necessarily becoming more similar. All who engage in interreligious dialogue should do so with full integrity in their own religious tradition and without compromise to what they hold dear. In interreligious dialogue we do not aim at creating a new or shared religion. (7) Interreligious dialogue addresses asymmetric power relationships with honesty. The power relationship between different religious groups is sometimes asymmetric. This can be caused by for example poverty/wealth, language, gender or numbers (minority/majority). Interreligious dialogue must not be used to obscure this. In dialogue the facts and experiences of asymmetric power should be addressed, and mechanisms should be found to give voice to those who struggle to be heard. (8) Interreligious dialogue furthers stakeholdership and participation in society. Interreligious dialogue should address a wide spectrum of issues. It is important to explore shared values and address common concerns, but one should not shy away from addressing issues on which there are disagreement, uncertainty or even fear of the other. Some current trends, such as rapid development of new technology in biology, medicine and communication and changing understandings of family are closely linked to questions of values and identities. Religions do not agree on the responses to these questions, but should discuss these matters with openness and courage. Dialogue is not a means to a predefined end, but it is intrinsic to genuine dialogue that it furthers mutual understanding, respect for differences, and the participation and stakeholdership of all in society and thus strengthens social cohesion. (9) Interreligious dialogue leads to common action. A full understanding of interreligious dialogue includes common action – diapraxis. The dignity of human life, to which all religions are committed, is challenged for example through poverty, violence, abuse of women and children, discrimination of migrants and dramatic changes in the natural environment. Different religions can address these issues together, although our ethics may draw on different resources. Interreligious dialogue should aim at mustering the resources of varying religious traditions to take up the challenges which Europe faces today. Through common action we learn to understand better ourselves, each other, and the world in which we live. (10) Structures for interreligious cooperation are assets in times of crisis. 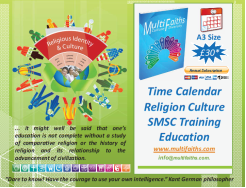 Repeatedly religion plays a role in situations of conflict. Established and trustful structures for interreligious dialogue are a tremendous strength when relationships between communities deteriorate. Religious leaders must address dangerous and violent perversions of religion within their own communities. (11) Knowledge and confidence in a tradition further interreligious understanding. Open and trustful interreligious dialogue is furthered by a secure knowledge of one’s own religious tradition as well as that of others. This knowledge should be taught in a spirit of peace and respect for the different traditions. Many religions make truth claims that are mutually exclusive. This is no more an impediment to dialogue and the full participation in society than the explicit or implicit truth claims of secular ideologies. Dialogue between religions, cultures and social groups is often dialogue across opposing truth claims and world views. (12) Religion has a natural place also in the public sphere. Religion continues to have an important role to play in the public life of a Europe with many religions. This applies to minorities and majorities alike. The public display of religious symbols or celebration of religious festivals should neither be seen as offensive to other religions nor as a threat to social cohesion. Religious minorities in Europe generally do not feel offended by for example public Christmas or Easter celebrations in countries where this is a tradition as long as their own freedom of religion is respected. (13) Religious leaders, religious people and the authorities share responsibility for interreligious dialogue. Convinced that interreligious dialogue is important for a peaceful and prosperous Europe we call on religious leaders of all religious traditions and in every corner of Europe to join in interreligious dialogue based on the principles outlined in this declaration. We call on all religious people in Europe to enter into the most important dialogue of all, “the dialogue of life”, in the local community, in families and workplaces with confidence and courage. We call on the authorities on local, national and European level to engage constructively with religious communities in mutual respect for each other’s different roles, and to create frameworks within which religious practices and interreligious dialogue based on the principles in this declaration may be further developed and prosper for the benefit of peaceful coexistence in Europe. Religions deal with the many basic questions: How life began, and what happens to us when we die? From the beginning, religions have attempted to explain these questions and offer people the opportunity to experience that invisible presence or spirit, sometimes as a sense deep within themselves. Each religion has developed its own ideas, beliefs and rituals on these matters. Not all beliefs about these basic questions involve religion however. Atheists or humanists, for example, are not religious and deal with the same basic questions by finding ultimate importance in the natural world, and human beings in particular, rather than in God or gods. * Community - the social aspect of a religion, e.g. the worshippers at a particular church or temple, the wider denomination or sect, monks, nuns and priests. 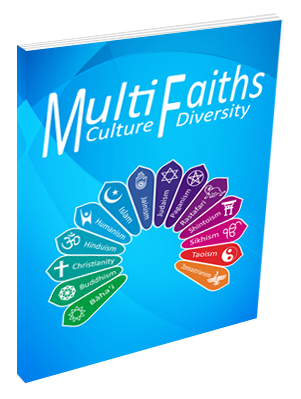 * Does your organisation deliver services to people of different faiths? * Do you work in partnership with religious organisations? * Are you an employer of a religiously diverse workforce? * Are you unclear about the legislation relating to religion and belief and how this affects you? * Do you want to start an inter-faith project and want some guidance? * Are there religious tensions in your area of work which you want to reduce? * Do you know whose hand you can shake and which days are religious holy days? There are ten potential roles that faith and inter-faith groups can play in promoting community cohesion. These have been clustered according to the types of ‘capital’ they might bring. ‘Capital’ is used in the widest possible sense and is taken to mean any resource, asset, advantage, and predisposition that individuals and groups might bring to the cohesion table. Each role has its own unique and overlapping contribution and underpins the huge amount of work that is faith inspired in areas of regeneration, civil renewal and education. provide a neutral space for participants to come together ? provide a sacred space for those who wish to worship? provide a safe space for dialogue and dissent? provide clear ground rules for dialogue and activity? provide clarity as to the language and terms used ? promote a subject and cross curricular approach ? promote a whole school/college approach ? promote aspects of urban renewal ? promote longer term sustainability ? provide a mechanism for sharing insights and outcomes with a range of stakeholders ? celebrate young people’s faith identities ? celebrate the religious and spiritual capital young people bring? celebrate young people’s multiple identities ? celebrate the commonalities of faiths ? counter the myths and stereotypes surrounding faith groups, including, in particular, Islamophobia ?